It is 10.30pm and Ahsan Iqbal is winding up his election campaign for the day in a rural neighbourhood of this border district. Towards the end of his speech he talks about accusations that his party and leaders have gone soft on the issue of Namoos-i-Risalat, a refrain his main rival, Pakistan Tehreek-i-Insaf’s (PTI) Abrarul Haq, is also using to take the National Assembly seat (NA-78) from him. “Namoos-i-Risalat is our faith,” thundered Mr Iqbal, who survived an attempt on his life during a rally in early May. The gunman who shot and wounded him is alleged to have links with an ultra-religious group. The amendment to a law related to the Khatm-i-Nubuwat had led to countrywide violent protests and lockdown in Islamabad last winter. 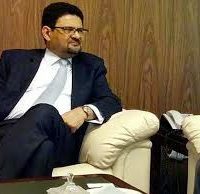 The change was later retracted and law minister Zahid Hamid was forced to resign his job as a result of the government’s deal with the protesting group brokered by the military. “No one in the world has a right to issue a certificate of faith against his fellow Muslims. It is for Allah to decide who is a good Muslim and who is not,” he argued before reminding the crowd that his mother Nisar Fatima was one of the key movers of the blasphemy law. The Tehreek-i-Labbaik Pakistan (TLP), which was leading the attack on the government and the PML-N in the wake of the amendment, as well as Tehreek-i-Labbaik Islam, are taking part in the election. The TLP alone has fielded more than 250 candidates across the country for the July 25 elections, pledging to stop the PML-N from returning to power. The group, which had fought two by-elections in Punjab against the PML-N, the first for a Lahore seat that fell vacant after former prime minister Nawaz Sharif lost his job for a third time when the Supreme Court disqualified him in a corruption case a year ago and the second in Chakwal, is believed by many to have been created to play the role of a ‘spoiler’ in the elections. Many contend that it could hurt PML-N’s chances in many places across Punjab. “TLP is created to break away our religious voter… but the results of both by-polls in Lahore and Chakwal last year show that it failed to do so,” Mr Iqbal told Dawn later at his election office in Narowal. “It cannot hurt our chances… our voter has matured over the years and will not be trapped by such tactics. His supporters say Mr Iqbal is forced to talk about the issue of Namoos-i-Risalat because his Pakistan Tehreek-i-Insaf rival Abrarul Haq is using it against him. “The PTI candidate is facing a lot of resistance from the constituents because he lost touch with voters after his defeat in 2013 unlike Ahsan Iqbal who was available to them on weekends despite being busy as minister. Ever since Abrarul Haq has come back to Narowal for election, he is using religion to discredit his opponent,” a local trader said to this reporter. But religion isn’t the only issue Mr Iqbal’s challenger is using to thwart his plan to win the seat for the fifth term. He is also banking on large Jatt vote from the constituency besides his social work. PTI’s growing popularity and the perception that the establishment doesn’t want PML-N to win back power will also go in his favour, according to his supporters. Back at the election rally, Mr Iqbal rounded off his speech with a promise of development of the area in next five years. “The new delimitation scheme has not only reduced Narowal’s seats from three to two, it has also added many new areas to his constituency which means Ahsan Iqbal has to spend more time in these areas to charm his new voters,” a local journalist said. 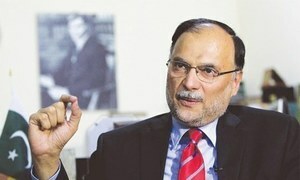 Like other fellow PML-N candidates, Mr Iqbal also feels that a combination of the development the PML-N governments at the centre and Punjab have done over the last five years and the party’s struggle for ensuring the sanctity of the vote after disqualification of Nawaz Sharif would help the party win re-election. So when he reminds his voters how their government had ended power shortage and brought peace to the country, he also asks them to avenge the injustice done to the former premier by turning up in a bigger number on polling day.